A professional musician knows that a successful orchestra is run with two things—procedures and organization. There are procedures for auditioning, procedures for rehearsals, and of course, procedures for performance. 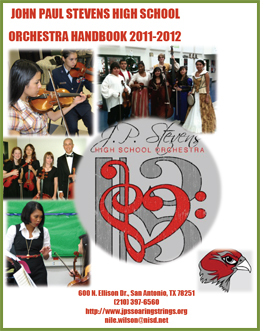 That’s why Nile Wilson, the Orchestra Director at John Paul Stevens High School in San Antonio, Texas, shows up to her first day of school armed with an entire handbook of procedures. Like all effective teachers, Nile understands that organization is everything! It’s a fact—50 percent of teachers leave the profession within five years. Those who succeed excel in their classroom management skills. Through the years, we have featured teachers with these skills in many of our teachers.net articles. We first shared Nile Wilson’s story with you in the December 2008 article. Early in her teaching career we were impressed with her organization and ability to bring out the best in her students. We recently caught up with her and found that her orchestral program continues to grow and succeed and she continues to be an effective classroom manager. Seven years ago, Nile Wilson was a brand new teacher at a brand new school. 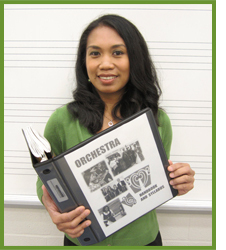 She was given the enormous task of building an orchestra program. This is no easy feat. An orchestra teacher must consider different instruments and different skill sets. There is concert music, ensemble music, and solo music. There are exercises for warming up, instrument technique, tuning, and sight-reading. A director must address everything from student safety to the accomplishment of a complicated score. So how did she do it? Nile walked into her new job armed with procedures, procedures, and more procedures. In less than three years, Nile established an orchestral program that included a Prelude Orchestra, (for freshmen and less experienced players), a Concert Orchestra, Strolling Strings (the “ambassador” group that performs for school functions), a Chamber Orchestra (the top ensemble that competes as a string and full orchestra), and a Beginner Ensemble. Nile also teaches a 5th grade beginning strings group at one of her elementary feeder schools and regularly assists at her feeder middle school programs to establish a relationship with her future students. In addition, Nile teaches a one-week summer program to prepare her students for the year to come. Today, her orchestra program is thriving, receiving top accolades, and the highest ratings at competitions. Nile has refined and trimmed her procedures to make them more workable for her students. As she learns from each new student and parent, she continues to adapt her procedures to better fit the needs of her class. Nile’s students begin class with the same procedures every day. The first thing they do is refer to the Daily Agenda that is posted on the agenda board. 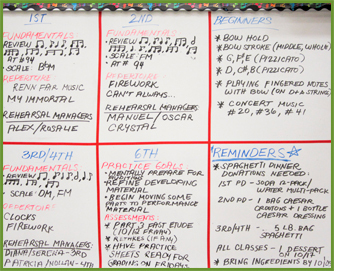 The Daily Agenda lists the sequence of procedures they are to follow to prepare for class. Students are expected to retrieve their instruments and be in their seats, ready to play, by the bell. Class begins with stretching and warm up exercises, led by a student. Next, the concertmaster leads the class in tuning. Meanwhile, designated Rehearsal Manager students take attendance and distribute the materials for the day. Cellists and bassists must keep their cases in the lockers. Pins must be retracted until it is time to tune. Violinists and violists must keep their instruments in their cases until it is time to tune. Be in your seat by the tardy bell. You are tardy if you arrive after the bell. Do not play until after the tuning. Do the warm-ups as shown by the leader. Focus and avoid talking. Follow the tuning procedure as shown by your concertmaster. Submit any passes to your director. Promptly retrieve your instrument and music. Warm up in the back of the room. Check the Make-Up Work Box or Summative Assessment Sheets. Ask your rehearsal manager before asking your director for clarification. If it still doesn’t make sense, ask your director for help. Remember, YOU are responsible for missed work. Notice that up to this point, all of the work has been done by the students themselves. They all know what to do, when to do it, and how to do it. Why? Organization. Nile’s classroom is self-sufficient and runs like clockwork. Nile’s classroom is consciously planned. There are procedures regarding musical challenges, performance etiquette, and classroom courtesy. There is a procedure for where to sit and for leaving in the middle of class. There are procedures for what to do when you are late, for being absent, and for ending class. If you can think it, there is a procedure for it in Nile’s classroom. Procedures accompany every second of the day in Nile’s classroom. With so many procedures, it is important to make them accessible. So Nile created a handbook and posts a downloadable version of it on the orchestra’s website. In her handbook, Nile thoroughly explains every classroom procedure, starting with where to sit and ending with how to earn leadership positions. Nile covers in detail the attendance policy, the grading policy, and policies for extra-curricular activities. She covers everything. And if there isn’t a procedure in place for something that happens in the orchestra class, she creates one and teaches it to her students the next time they enter the classroom. For freshmen and students new to the orchestra, Nile holds a student and parent orientation meeting and registration night on one evening during the summer. During the school year, Nile teaches her procedures in smaller, more manageable chunks whenever they become relevant. For example, she does not teach, practice, and review stage protocol (which includes entrances, exits, when to sit and stand, and bowing) until a couple of days before the concert. Nile created a video that outlines her daily procedures. This video is posted on the orchestra’s website, right next to her Student Expectations and downloadable pamphlets of her classroom procedures. Click here to view the video. Nile keeps the orchestra website updated with recent news and photos. 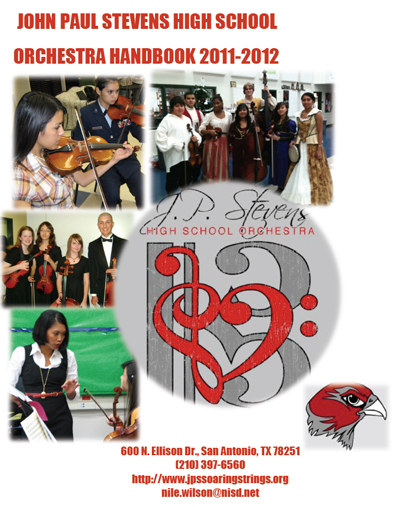 Students interested in the program can find information about the orchestras, as well as how to register. Current students and parents can submit forms online for everything from borrowing a school-owned instrument to traveling on the bus. Through her website, Nile has made it incredibly easy for her students to learn her classroom procedures and put them into practice. 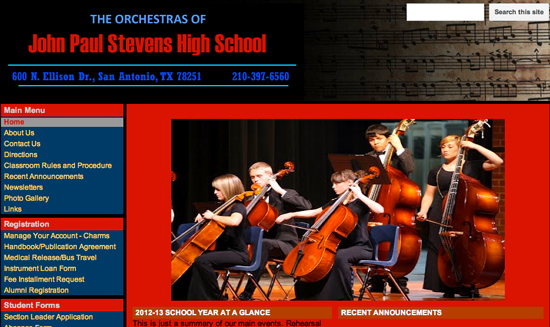 Click here to visit The Orchestras of John Paul Stevens High School website. Seven years after Nile began the orchestra program, her students continue to exceed expectations. Last year, the varsity group (Chamber Orchestra) performed more concerts than ever before. They were even given the opportunity to accompany “Asia’s Prince of Popera,” Filipino tenor Jonathan Badon. This was the first time the orchestra performed side-by-side with a professional musician. The Chamber Orchestra continues to earn Division I ratings at the UIL Concert and Sight-reading Contest in both String and Full Orchestra. 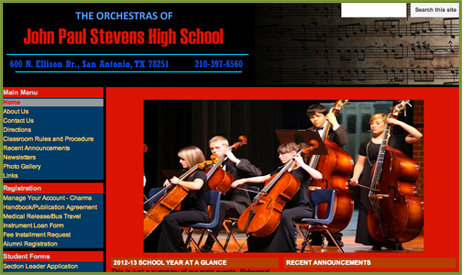 The Chamber Orchestra will compete in the Texas Renaissance Fair’s Early Music Competition. Nile’s students not only succeed while in her orchestra, but they succeed beyond the program. The procedures and professionalism Nile teaches, prepare her students to excel beyond her classroom. Many of her students have gone on to earn spots in the Texas Music Educators Association (TMEA) Region 11 Orchestra. 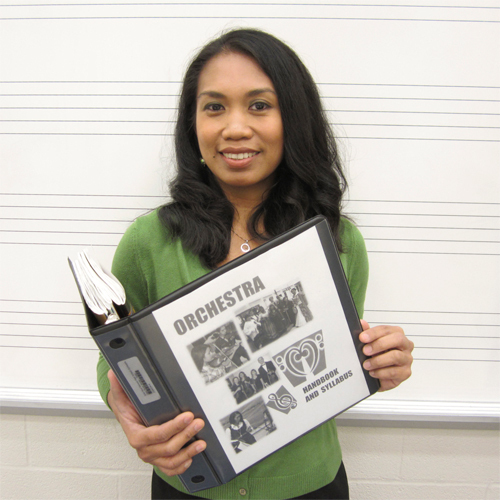 Even more impressively, many of her students have been inspired to pursue careers in music education. As a young musician in her native Philippines, Nile Wilson learned that procedures and organization were the keys to becoming a successful musician. Now she knows that these are also the keys to becoming an effective and successful teacher. Through her high level of organization, Nile treats her students with the same respect that a professional conductor would treat an orchestra. Her students love music and love learning. They are successful because they always know what to do, how to do it, and when to do it. How you conduct your classroom will determine the level of your success and your students’ success. It is now two to three months into the school year. 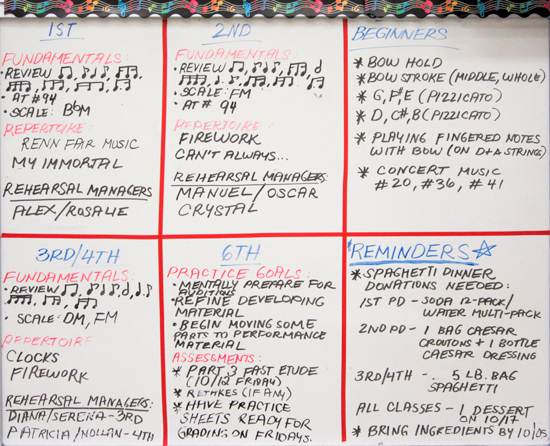 Is your classroom organized so the students have time to learn? You were hired to teach. And if you spend most of your time correcting, disciplining, and scolding students, we suspect you lack procedures so your students know what to do. It’s never too late to orchestrate your classroom for success. Teachers can choose to be effective any day of the school year. If your classroom lacks organization and procedures, you can start tomorrow. Think of the one or two procedures that would make all the difference for you and your students. Introduce those procedures and practice them until the action flows smoothly. Next week, introduce two or three more procedures and follow the same process. Introduce and practice them until they flow smoothly. Keep adding procedures throughout the weeks to come. Every orchestra is filled with talented musicians playing diverse instruments. But it takes a conductor to synchronize the notes coming from those instruments to create the beautiful music for an audience to enjoy. Every child in your classroom has potential. Become the conductor for your students and orchestrate the beautiful music to fill your classroom. You’ll hear engagement sounding from your students. Your classroom will hum with learning. to create beautiful music every day in your classroom. This printable version is provided for the convenience of individuals.